Glock is one of the most popular pistols in the world. This page used to be the Glock order page, but we consolidated the order pages under Holster at Right. If you are looking for a Glock Kydex Holster, or a Custom Kydex Holster to solve a specific carry problem for your Glock you have come to the right place. 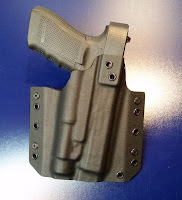 We can make Kydex holsters for any Glock Gen 3, Glock Gen 4, and some Glock Gen 2 pistols. Here are a few examples of Kydex holsters what we have done for Glocks. Take a look around the site let us know if you have any questions.